The Walt Disney Company Bought Back 74 Million Shares in 2016 -- Should Investors Be Happy? The House of Mouse is spending billions every year on share buybacks. Is that the right thing to do, or are there better options available? Walt Disney (NYSE:DIS) loves to retire its own shares from the open market. I mean, management absolutely adores the very idea of share buybacks. Should Disney shareholders applaud that attitude, or could the buyback budget be better spent elsewhere? In fiscal year 2016, Disney spent $7.5 billion on share buybacks. The company canceled 73.8 million shares at an average price of $101.60 per share. Only 5% of these buybacks were matched by newly printed share stubs under Disney's stock-based compensation programs. The rest went directly into reducing the number of outstanding shares. The buybacks in 2015 accounted for 89% of Disney's free cash flows, which increased by 27% year over year to $8.4 billion. So there's no doubt that Disney is serious about its share buybacks. This is no dilly-dallying hobby but a major destination for the funds that the Mickey Mouse cash machine generates. In fact, Disney only spent $2.3 billion on dividend checks in 2016 along with $4.8 billion on the capital costs of running and improving its theme parks, cruise ships, and other physical properties. The share repurchase budget has both of those cash costs beat by a wide margin. As a Disney shareholder myself, I certainly appreciate it when the company pours its cash profits right back into my pocket. Disney reduced its share count by roughly 5% last year, thus increasing the relative value of each existing share by the same amount. It's a shareholder-friendly policy as long as there aren't any objectively better places to spend the same cash. Disney has several alternatives to this cash-return policy. The company could simply sit on the cash, growing its cash balances quarter by quarter. As it stands, only $341 million of Disney's $9.8 billion in net income or $13.2 billion in operating cash flows trickled all the way down to the bottom of the cash flow statement, increasing the company's cash equivalents by 8% year over year. Without the buyback expense, Disney could have nearly tripled its bank ledgers. Management could also have doubled its capital expenses instead. The recently opened Shanghai Disneyland park cost about $300 million to build and the Disney World Animal Kingdom park reportedly ran up a $1 billion pre-opening bill. The company announced two new cruise ships in March, expected to launch in 2021 and 2023 at a cost of roughly $2 billion. Redirecting the buybacks into new parks or ships could grow Disney's asset portfolio very quickly. Finally, income investors would love to see Disney boosting its fairly thin dividend policy a bit. Taking that idea to extremes, adding the entire $7.5 billion budget for the last fiscal year's share buybacks into the dividend pot would have boosted the payout by $5.10 per share. 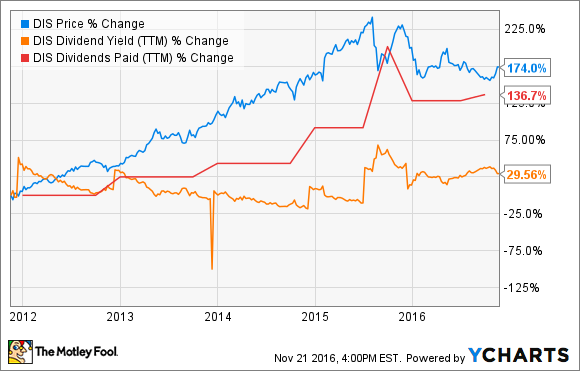 The dividend yield could have stopped at 6.7% instead of today's skimpy 1.5%. Delicious, right? So why stick with the heavy buyback budget? All of the alternatives have their upsides, but none of them are perfect. And don't forget that a generous buyback policy comes with some unique benefits of its own. Disney is already throwing a ton of cash into its capital expense budget. Those new cruise ships don't come cheap, and a brand-new park in China is a huge move. Doing too much at once could backfire due to the immense scale of Disney's existing infrastructure. Managing this empire is not easy, especially while expanding the resort network drastically. In my view, Disney is doing exactly the right thing by taking a measured approach to its capital asset growth. I'm not opposed to a mild dividend boost, but Disney is already doing its part there. Five years ago, Disney's dividend stood at $0.40 per share, paid in a single annual check. Today, the annual payout is $1.42 per share -- a 255% increase in just five years. The policy has been split into two payouts per year, giving management more granular control over its dividend expenses. As for the thin dividend yield, it's kind of hard to complain about a stagnant yield when share prices have gained 174% in five years. The payouts are fighting an uphill battle against the rising stock price, and that's a downright nice problem to have. Should Disney be stuffing its own coffers at the expense of cash returns to shareholders? Show me one investor who prefers this strategy, and I will sell him a bridge in New York. Sure, this would make sense if Disney ran a financially struggling business with huge cash deficits or incredible debt loads. But that's not the case at all. Disney's debt-to-equity ratio is either comparable to or much lower than what you'll find elsewhere in the capital-intense resort and media industries. The company is actually working to optimize its balance sheet by adding more debt while interest rates are low. Given total control over the company, I would not change the capital returns strategy significantly. Maybe push a little harder on the capital expense accelerator, perhaps just a sliver more emphasis on the dividend growth, but nothing game-changing. And don't forget that big buybacks are a solid sign of insider confidence. Management is acting as if Disney shares were severely undervalued, making for a great investment whether you're an individual share buyer or running the company itself. After considering the options, I'm a happy camper. Yes, we Disney investors should be happy with these buybacks.